EXETER – The Monarchs have struggled with dreadful errors for much of this season, and they were on full display during their Central Sequoia League home opener on Friday, March 15. Exeter committed nine on the day, which contributed to 9-6 losing effort way to the Immanuel Eagles in 11 innings. The two errors that hurt Exeter (7-3, 0-1) the most came in the top of the eleventh inning. 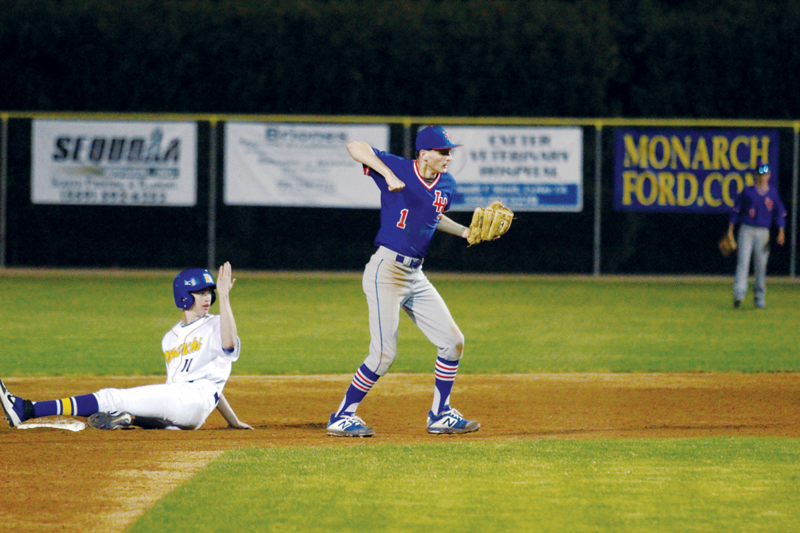 Immanuel’s (9-1, 2-0) Derek Wood was on second when JT Friesen laid down a squeeze bunt. Exeter’s pitcher Julian Vargas came up to field it, but had to rush his throwto get Friesen out. The ball sailed wide, and Friesen scored what would be the game winning run to make it 6-5. Shortly after Kirkman put Blake Crookshanks on the mound, but only a couple batters in he also committed an error. 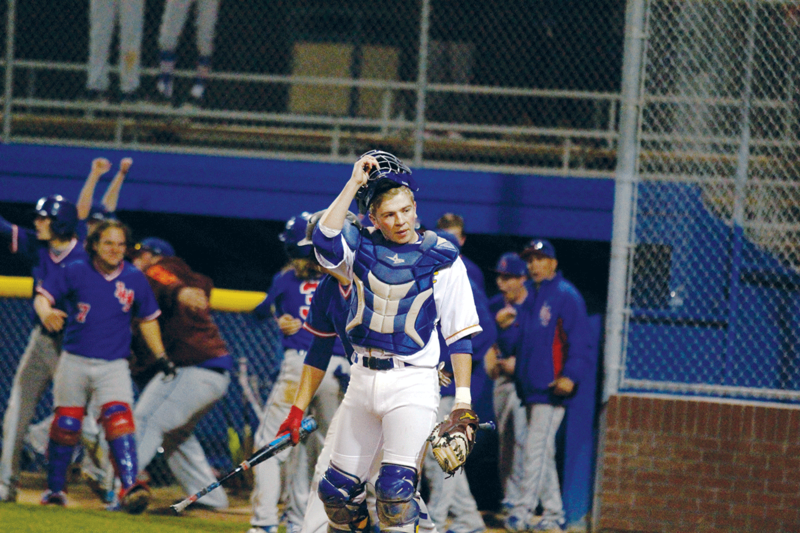 Immanuel had bases loaded when they laid down another bunt attempt. Crookshanks came off the mound to field it, but instead of coming home with the throw he rushed the throw to first. The balled sailed up and over the Exeter’s first baseman’s head, and allowed Immanuel to score two more making it 8-5. On the next pitch Immanuel scored their final run when Crookshanks threw a wild pitch. Exeter’s Cliff Evertt gets tagged out at second base in the Monarchs’ home opener. Exeter’s best chance in the extra frames came in the bottom of the eighth inning. Jackson Brooks stepped up to the plate with runners on third and second. A single would have scored a run, and ended the game with Exeter on top. Instead Brooks hit into a ground out to second base which ended the inning. Even before the extra innings, Exeter had a chance to close out the win. Sal Briones handed Exeter the lead in the third and fourth innings. In the third he knocked in Vargas when a hard hit ground ball wasn’t fielded cleanly by Immanuel’s short stop. Vargas represented the tying run at the time 3-3. Briones was able to get into scoring position after reaching third on a errant pickoff attempt at first. And when Immanuel threw a wild pitch a short while later, he scored to give Exeter the lead 4-3. “We need Sal to get hot,” Kirkman said. Briones’ insurance run was scored in similar fashion. He reached third on another errant pickoff attempt after being walked. This time though, Caleb Reynoso drove him in making it 5-3. Briones led the Monarchs going 3-4 with one RBI and scored four runs. As expected, Exeter threw their ace Jaykob Acosta on the mound. He threw six and a third, and received a no decision. He struck out nine, and gave up five runs. Only one of those runs was earned. Acosta could have finished the game if Exeter had been able to get out of the top of the seventh inning. Instead a couple errors kept Immanuel alive, and Acosta hit his pitch count of 110, which meant his night was done. “We battle and make a play that inning he probably finishes the game,” Kirkman said. There was no time for the Monarchs to dwell on what had happened. They hosted the Coast Union Broncos (0-6, 0-1) in a non-league contest last Saturday. The Monarchs memories must have been short as they shutout Coast Union 10-0 while committing just a single error. Vargas went 2-3 with an RBI and scored two runs. A win over Coast Union might have been a good bounce game, but Exeter shouldn’t celebrate too much as they head into a difficult week of CSL play. Last night, Exeter traveled to play the Central Valley Christian Cavaliers. Results were reached after press time. Exeter returns home to face an emerging Selma Bears team on Friday. First pitch is scheduled for 7 p.m. Selma is in a tie with Immanuel at the top of the standings.